Toddler Approved! 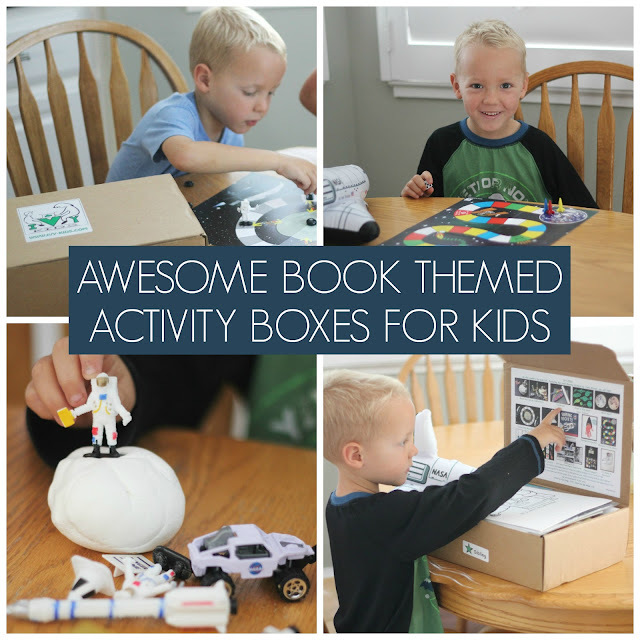 : Awesome Book-themed Activity Boxes for Kids! 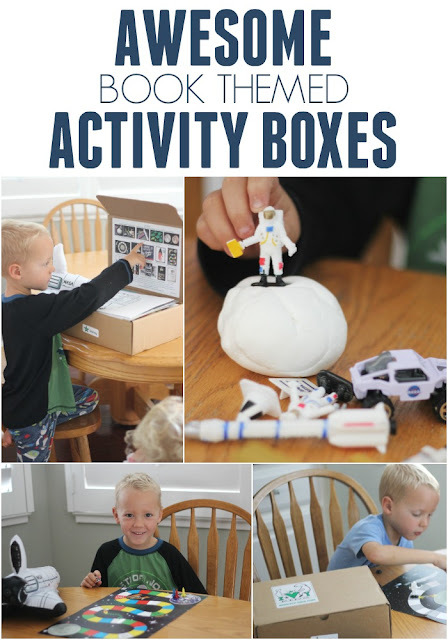 Awesome Book-themed Activity Boxes for Kids! School started about three weeks ago for my big kids and between Room mom meetings, work deadlines, cleaning the house, laundry, soccer, etc., I am exhausted. My kids often come home from school begging to do some sort of project or something fun together. Usually I send them off to their rooms to play or outside to find neighbors. Occasionally we'll sit down and do some sort of game or craft or open ended activity. I absolutely love having Ivy Kids subscription boxes for these moments when the kids don't have an idea of what they want to do but they want to do something fun (and my creativity is zapped!)! Ivy Kids activity boxes are filled to the brim with book inspired activities for kids! I'm excited to tell you a bit about them and share some of the details about the three boxes we've tried recently. This post is sponsored by Ivy Kids. All opinions are my own. WHAT ARE IVY KIDS KITS? Ivy Kids kits are monthly children's subscription boxes for kids ages 3-8. You can adapt some of the activities for older and younger kids as well. My 18-month-old had a blast with a few of the ideas we adapted. The kits focus on math, literacy, and science and are a lot of fun! Ivy Kids Kits arrive during the first week of each month and each kit has a new theme and children's book. Here's a quick visual so you can see how Ivy Kids Kits work. WHAT CAN I EXPECT IN MY IVY KIDS KIT? Here's a sneak peek of what unboxing Ivy Kids Kits looks like at our house! Lots of excitement!! I am IN LOVE with the packaging for the Ivy Kids Kits... especially the quick photo overview of what is inside each kit right on the inside of the box. Having a quick view of all of the activities (through pictures and text) is SO EXCITING, especially for my four year old who can't read yet. He loves being able to see what to expect! Once our box arrives the kids just scan the activity ideas and are able to point out one they want to try right away! Each box includes fun and engaging educational activities developed by certified early childhood teachers. Games, materials, and projects can be played again and again. There are between 12-15 activities included inside each box and they range from games to art projects to science experiments. Everything that you need to play is included in the kit. You don't have to look around for glue or paint or pipe cleaners. It is all inside so that you can channel your child's excitement and get creating and playing right away! Everything fits inside the box too, so once you're done with one activity you can easily close everything back up and store it away until you are ready to try another one. Each box also comes with a children's book related to the theme of the box. These are great, well thought out, awesome book choices (not cheap poor quality books). SOME IVY KIDS KIT EXAMPLES! 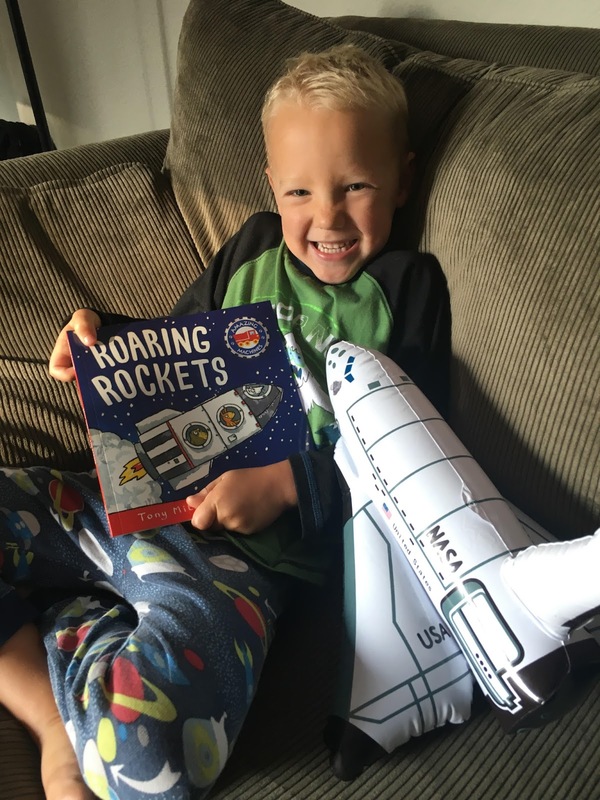 My kids were a bit obsessed with this rocket/space themed kit inspired by Roaring Rockets by Tony Mitton. Here are a few pictures as we played and explored. We've only made it through half of the activities. We've had so much fun that we keep doing several of the games again and again. My kids recently watched Finding Dory and are in LOVE with octopuses, so this kit was amazing. We have only made it through four of the activities since the ones we did do we are constantly redoing, especially the octopus ink experiment. My kids retold the story again and again using their ocean animals and a tub with water for days! The toddler had a blast dropping the animals into the water and making them swim around while my 4-year-old tried to do a story retelling. We did the octopus ink experiment with several different ocean animals and when we ran out of ink (after the 7th time doing it), we used liquid water colors instead. My 6-year-old daughter loves all things little and creepy crawly so she has spent all of her free time exploring the ladybug kit over the last few weeks. Planting seeds and using the cool soil pellets that were sent might have been the highlight of her week! She loves growing things and was so excited when she got to plant real life seeds in real life dirt!! In addition to including a lot of materials in each box, Ivy Kids kits come with simple written and visual instructions for each activity and the instructions come with suggestions for how to modify the activities for younger kids (Little Ivy kids ages 3-5). There are also questions included that help scaffold learning and help you expand on the themes and have conversations with your kids about what they are seeing and learning. Ivy Kids kits are perfect for busy parents, homeschooling parents who want some resources, and families that need some fun together! A monthly subscription costs $38.95 and if you purchase 3 or 6 months at a time then your price goes down a bit. You can find the prices for the Ivy Kids Kits here. Each single kit costs $38.95 and you can purchase kits that were previously sent out. You can see them all here. These make awesome gifts! Our friends at Ivy Kids have sent along these discounts for our Toddler Approved followers! Use code IVY20 to save 20% on your first kit when you purchase any recurring subscription. Use code PASTKITS10 to save 10% on any of our past kits available in our store, no subscription necessary. If you've tried an Ivy Kids Kit I would LOVE to hear which one! Tell me in the comments. Any themes your kids are obsessed with that Ivy Kids should turn into a box?